Like all art forms, container gardening works best with rampant creativity that follows certain guidelines. Think of the guidelines as “hints” of how your creation will look and perform the best. Happily the hints are so broad that you can do almost anything within them. Think of making containers as gardening for people who don’t like commitment. Trees and perennials endure, but each new season can bring an all new look to your planters. 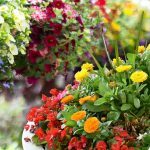 When container gardening was in its infancy, the goal was to cram as many flowers into one pot as possible. We’ve matured since then. Recipes replete with foliage annuals like coleus and sweet potato vine, succulents and even edible herbs and veggies are popping up on patios everywhere. We’ve discovered the subtle beauty of leaves, branches and fruit. Contrasting colours used to be the only element of design we thought about. Now we’re weaving together elements of shapes and texture to expand our creative scope. • Whether short, tall, skinny or fat you choose the container. 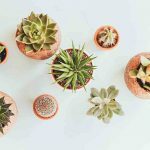 But to keep your sense of scale (unless you’re going for a far-out contemporary vibe), the height of your plants should be your container’s height plus a third. So if your container is 3 feet high, your plants should be about 4 feet high. • If your container is going the wall, put your centerpiece at the back to give the illusion of more space. You’ll be able to get away with a smaller pot or a grouping of them. Centerpiece plants: These provide the vertical focal point and are often the most striking architectural feature. Their shape ranges from being very vertical (Millet, Cleome) to being more loosely vertical and airy (Guara, Fountain Grass), to being lush, leafy, and just plain large (Canna Lily, Hibiscus). 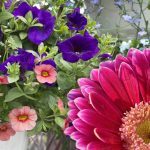 The shape of your centerpiece plant will usually determine the shape of your container garden, so it’s important to look at the habit of the plant in addition to the numeric height and spread. Shrubs make excellent central features and you can plant them in the garden in the fall as a bonus. If you’re thinking of adding a shrub to your yard, you can get a free container centerpiece out of the deal. 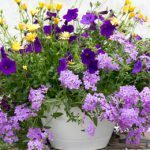 Central plants (Fillers): these are usually mounding plants, either flowering or foliage, that will provide the body and the bulk of your container. They typically have a mounding habit. When you’re choosing them keep in mind the proportionality of its size to the rest of the elements in the container. Look here to provide the heavy lifting for your flowers. 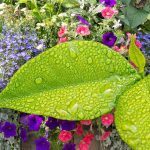 Trailing plants: These are cascading plants that flow out of the container and provide a sense of height to the container garden and soften the container itself. Some trailing plants have more volume than others and may compete with your filler plants for space. 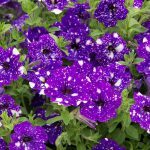 For example, Superbells Calibrachoa are also robust filler plants and so you might want to leave some room for them to grow upwards as well as down, while Bacopa will tend to trail right away. If you have a tall container (or an ugly one), choose long vines to masque it. Likewise, if your pot is stout than opt for smaller or no vines to keep the sense of scale.